A new service for those affected by cancer in East Cork and West Waterford was officially opened recently by well-known and much-loved Irish celebrity, Majella O’Donnell. Located at 29 Friar Street Youghal, and run by the Cork ARC Cancer Support House, the centre provides free drop-in and telephone support services, counselling, therapeutic massage, reflexology, yoga, pilates and art therapy for cancer patients and their families. While the centre has been operational for a number of months, Majella O’Donnell was delighted to perform the official ribbon cutting ceremony in Youghal (Wednesday 15th August), and to meet with the team and those who avail of the centre services, which are all provided completely free of charge. “In supporting, helping and listening to those affected by cancer, the work of Cork ARC Cancer Support House in this area is absolutely vital. Their discretion, professionalism and experience make an enormous difference to men, women, children and families who are dealing with cancer,” said Majella O’Donnell. 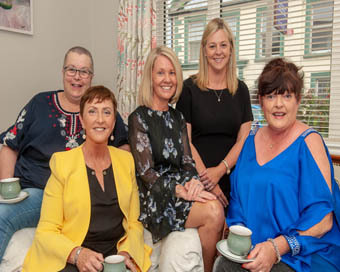 More than 86 people have already availed of the Cork ARC Cancer Support House in East Cork, which is supported the Trustees of Cuan House, Emer Casey Foundation, Alcon Laboratories and a wide range of donors, suppliers, visitors and community partners. With a team of more than 12 volunteers and professionals, Cork ARC Cancer Support House in Youghal is open every Wednesday from 10am to 4pm.